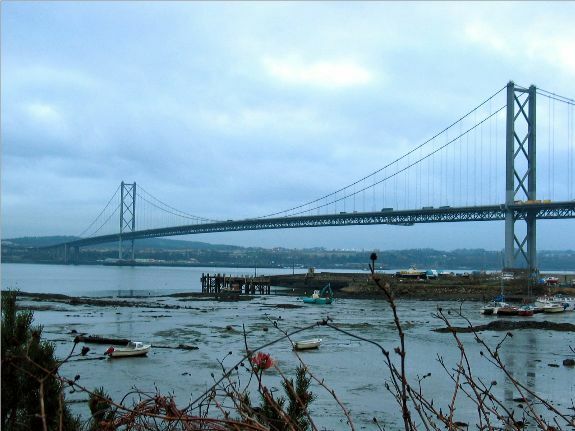 The Firth of Forth is an estuary of the River Forth in eastern Scotland, and the Firth of Forth Suspension Bridge is a major crossing for motorists, pedestrians and bicyclists who need to cross the forth. The bridge was completed in 1964 at a total cost of 11.5 million British pounds. With a total length of 5978 feet (1822 meters), it was the longest bridge of its kind outside the United States at that time. Even though the Firth of Forth Suspension Bridge is an engineering marvel and one of Scotland's most used (and most loved) bridges, its expected lifespan has been more than cut in half due to extensive corrosion of the steel cables that are having to support twice the maximum intended load. In fact, it may have to be closed as early as the year 2015 unless a thorough overhaul is performed at great expense. If you plan to visit the beautiful country of Scotland, chances are you will cross the Firth of Forth Suspension Bridge at some point during your stay. If you do, take a few pictures because you'll be crossing a true European landmark that most likely won't be around too much longer.